A couple years ago, I was engaged to someone who was working for the Bernie Sanders campaign, and I spent a great deal of time around liberals and progressives who supported this cause. However, while they cared deeply about many forms of oppression such as institutional racism, mass incarceration, and climate change, they actively supported oppression against people labeled "mentally ill" - from arguing that Donald Trump's supposed "mental illness" should disqualify him from the presidency, to advocating for increased involuntary commitment. Some of them also opposed vaccinations on the grounds that they may cause autism, which they saw as a terrible tragedy. Any time I attempted to critique the ways they were harming mad, neurodivergent, and disabled people, I was told that I sounded crazy. Speaking out against psychiatric oppression would detract from the credibility of the entire Bernie Sanders movement, they said. "You sound like a conspiracy theorist." I was told I needed to shut up, get in line, and wait my turn. "Just focus on the real issue, Emily," my ex-fiancé said. "We need to get Bernie Sanders elected. Eventually, people will come around to your side and see that psychiatric coercion needs to be addressed. But if you make a big fuss about it now, people will just think you're crazy and stay away from you." And when, after hearing that Donald Trump "shouldn't be president because he's clearly mentally ill" for the 20th time each day, I would have a meltdown, I was told that I not only seemed crazy but that I was embarrassing the entire movement. If I became angry and called people out as sanist for making this argument, I received the response, "How can you expect people to be on your side if you're so angry at them? If you're not even being nice? You're alienating potential allies!" Strange how none of the sanists were ever called out for alienating me. This experience lasted almost an entire year, and it wore me down. Every day I was asked to support, accommodate, advocate for, and "be nice to" a bus full of people that was crushing people like me underneath it everywhere it went. Every day I was asked to hide certain parts of myself under that bus in shame - my madness, my neurodivergence, my meltdowns, my belief in the abolition of paternalism - and assist the bus in running me over. Have you ever been thrown under the bus? If so, you know that it literally crushes your spirit. And when it happens repeatedly, on a daily basis, its effects are long-lasting. So, when I saw the above post, a huge part of me was absolutely thrilled. I felt incredibly validated for everything I had experienced during that period of time. 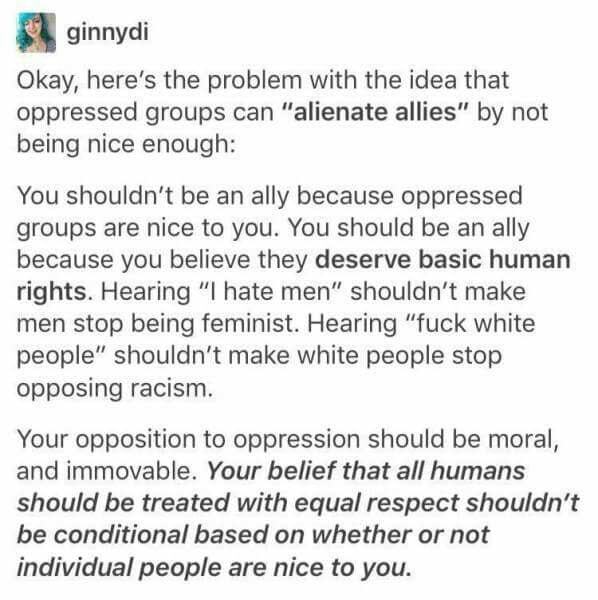 Finally, someone had put into words why it felt so crushing for me to be told to just "be nice" and not act so upset over so-called "progressive" activists supporting violent acts against people like me. But a smaller part of me had some concerns about that post because of that very experience. As mentioned above, the Bernie Sanders campaigners I spent time with cared very deeply about a variety of issues: mass incarceration, institutional racism, gender-based and sexual violence, access to healthcare, poverty, and more. And I want to make it VERY clear that I care extremely deeply about those issues too. I am a prison abolitionist, I support universal basic income and universal healthcare, and I am an abolitionist of racism and all forms of structural oppression. None of those strongly held beliefs or values would ever change based on whether an individual person is nice or mean to me. At the same time, though, being crushed under the bus by Bernie Sanders campaigners did make me feel much more hesitant about actively supporting those causes or participating in them in any meaningful way. Having to endure constant microaggressions, as well as the ever-present knowledge at the back of my mind that my fellow activists would feel comfortable with acts of violence against my community, was traumatic. It affected my brain and body in real, tangible ways. You can even ask my therapist (not that I believe mental health professionals should be seen as an authority on anyone else's mental or emotional well-being) - I absolutely experienced increased meltdowns, suicidality, and physical pain. So I felt that I had valid reasons to be hesitant to enter any leftist activist spaces that did not explicitly oppose coercive psychiatry and other forms of violence against disabled people. When attempting to speak out about this, I have been told to "check my privilege." I have been told, effectively, that sanism is less important than racism or all of the other aformentioned causes - that I should bottle up my hurt feelings and continue to be involved in activist spaces that support violence against me. In many ways, I can very much empathize with people who feel that they are not welcome in activist spaces due to not being part of a group that is currently being fought for. I can empathize with young white men whose pain is sometimes dismissed even though they may have been oppressed by adultism. I can empathize with fat people, who are seen as "privileged" and often disbelieved as victims of oppression and sexual violence. I can identify with individuals from wealthy backgrounds, who may be told that they are "benefitting" from capitalism when in fact they may have suffered horrific levels of familial pressure to maintain their upper class status. Too often, we ignore the experience of people whose victimhood is questioned, doubted, put to the test, invisibilized, and flat out denied, even in activist spaces that claim to support victims. And so, while I absolutely support the above post, I also feel that it is important to have a nuanced conversation about this topic. I feel that we need to have a conversation about how to acknowledge the intense levels of trauma and emotional pain that most activists carry with them every single second - both the trauma of being told to be "nicer" to their oppressors and the trauma of having their pain minimized by other activists. How can we dismantle the line of thinking in the above post while also calling attention to the traumatic impact of minimizing one another's pain? How can we acknowledge that a person's beliefs about marginalized groups should not be dependent on how they are treated by individual members of those marginalized groups, but that being excluded or disbelieved by a group might indeed have an impact on their ability to be involved in activism for the rights of that group? I think this issue ties in with call-out culture and public shaming, as well, which I know is a very controversial topic. While I think people who are willfully biased and bigoted (willfully meaning that they have had the opportunity to learn from their mistake/improve themselves in a non-shaming way) absolutely deserve to be called out and shamed, I also worry about the ways shaming and callouts can be re-traumatizing for mad/neurodivergent people and trauma survivors, who may have increased sensitivities around social rejection. I sometimes worry that the needs of mad/neurodivergent people and trauma survivors are also denied in this way by activist communities. How can activist spaces acknowledge the trauma and victimhood of every individual while also holding one another accountable for mistakes? How can we develop trauma-informed approaches to accountability without minimizing the impact of bigotry or demanding that marginalized people just be nicer to their oppressors? I recognize that I am very new to this area, and that my views (like everyone's) are heavily influenced by my trauma. I'd appreciate any resources or ideas for ways to think about this in the comments.